:: Did you feel the same way as I did? :: - Dreams are what you wake up from. Did you feel the same way as I did? Did you pause, and ponder, last week? Over your personal story, when the topic of Assignment One was revealed to you? Did you recall the memories, of the past events that shaped your life, and created the voice in you, that wanted to be heard? Only that there was no sound to the voice - the only sound would probably be the clattering of the keyboard of your laptop. The voice was metamorphosed into the written word - as you typed the last few concluding words to your story and submitted the prose with a click on the "submit" button. And did you feel that same way as I did, after you are done with your story, and then ventured into the forums? Did you read from the myriad of stories, shared by the many individuals - most, if not all, of them, would be people that you would probably never meet, in the course of your life? Did you feel connected to these writers, even though you have never met them in person? That the only common denominator was the fact that these people, like you or like me, had a voice, and enunciated this voice through the power of the written word. It became an intriguing discovery, somewhat voyeuristic at times, as I went from story to story, listening intently on the voices of the writers. There were heartfelt revelations - each writer had a reason to write. Writing started as a therapy and a hobby for Eric Valls Cabrera, while for Patrick Hogan, writing is simply a way of life, and a manifestation of logic and argument. And for some, writing is an expression of one's current frustrations and struggles, such as the one which was poignantly shared by Terence Wong. "This inability to articulate what comes to me intuitively has dogged me all my life. I think it no small irony." Did this statement resonate with you the same way as it resonated with me? 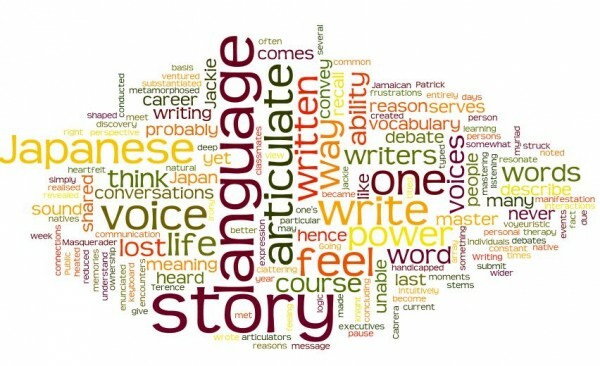 The power to write stems from the power to articulate, and articulation comes from the ability to master the language of communication, and the ownership of an array of vocabulary. I recall my university days in Japan. As I did not have any native ability in the Japanese language, my first year in Japan saw me struggling between learning the Japanese language and my first-year subjects, all of which were conducted in the Japanese language. My classmates were mainly Japanese natives, and with the constant interactions that I had with them, it was natural that our conversations were held entirely in the Japanese language. There were countless moments when I was engaged in a heated debate with my classmate. Debates, as we know it, are conversations of perspectives substantiated with a basis of reason. For these debates, I was very positive that my perspective was the correct one, yet more often than not, I lost a debate due to my poor command of the language. I was unable to describe my view with finesse, and that reduced my credibility. And hence I lost my ground. I realised then, on the importance of mastering a language. For we are articulate creatures, and if we are unable to convey what we think or feel through the right juxtaposition of words, to give our voices a meaning, then our voices would not be heard. We would be silenced, and we would not have the ability to form a connection with those around us. Do you not think that this is similar to how we write? While the reasons to why we write may be different, how we write serves a purpose; it serves to articulate our thoughts, and convey our message to a wider audience. Hence, if we feel something, and yet we are handicapped by our lack of vocabulary to describe that particular feeling, we would have lost the power to affect the readers. And hence, the meaning that I glean from establishing the connections with you and the many other writers in this course, is to understand how each and every one of us articulate. And with this, we all become better articulators. While it's never entirely similar, we can sometimes be either victims or winners of our deep-rooted perceptions. The only way perhaps is to be entirely comfortable enough of our intended external portrayal of our views and be confident about the induced reception.